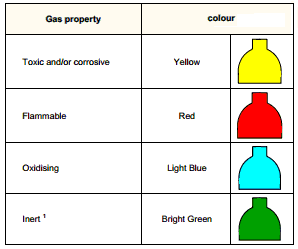 Gas cylinders color codes and their identification according to the gas property. Gas cylinders are widely used in pharmaceutical industries. It is important to know the color codes of the same because most of the gas cylinders don’t have any written information about their contents. Color codes are given for safety purpose and to prevent mix-ups in handling. The color codes are specific for the different gases. Gas cylinders may be colored with one or more colors according to gas filled in them. Upper curved part of the cylinder is known as shoulder and the lower as the body. Different color combinations of shoulder and body are used for different gases. 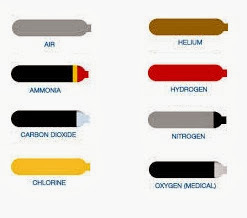 Color codes of gas cylinders may differ from country to country. The color of the gas cylinder indicates the hazard but not the filled gas. Poisonous and corrosive gas cylinders have yellow color while red colored cylinders indicate the inflammable gas in them. Oxidizing gas cylinders are light blue in color and inert gas cylinders are bright green. Note: Valves of oxygen gas cylinders should not be lubricated using oil and grease. It is a universal code. Perhaps someone can inform the reference. Thanks for the providing a valuable knowledge about pharmaceuticals. but in the above text, how to differentiate the oxygen and carbon dioxide cylinders ? while both color code are same. How can we differentiate between oxygen and carbon dioxide cylinders ? as per above text the color code for the both are same. Thanks very much for providing good information.